Russell & Kitty here. It is again Stretch Tuesday. We got home very late Sunday night, but we still have the carnival glass convention “glow”. Losing the hour on Sunday didn’t make our journey any easier! But we talked about the Southern California Carnival Glass Convention all of the way home and we are still talking about it today! They were celebrating their 50th anniversary; they do know how to celebrate! We did a program on “Carnival Glass with a Stretch Finish”. 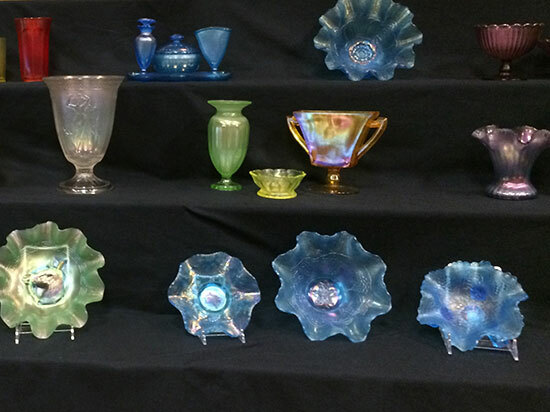 Remember that basically; carnival glass is patterned pressed iridescent glass. 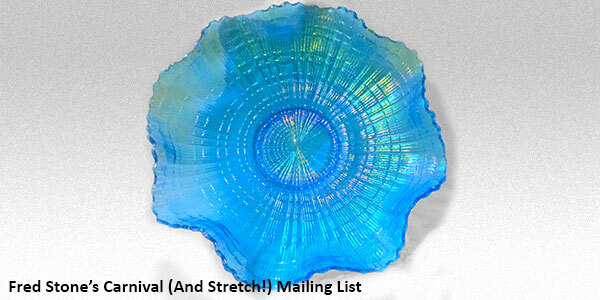 Basically stretch glass is without much of a pattern if any, pressed iridescent glass which is refired to create a stretch (contraction of the metallic salts finish that looks like an “onion skin”) finish. The stretch finish can be on purpose or by accident. 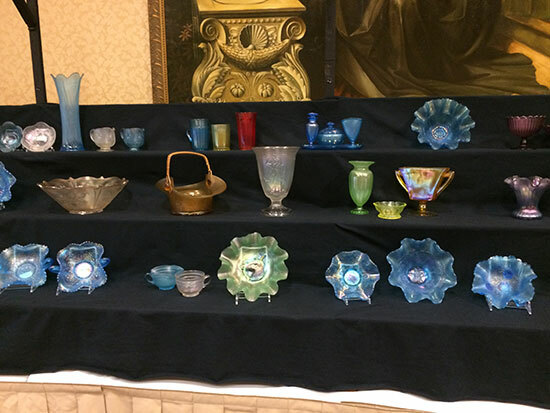 The display of Carnival Glass with a Stretch Finish that we talked about at the convention. 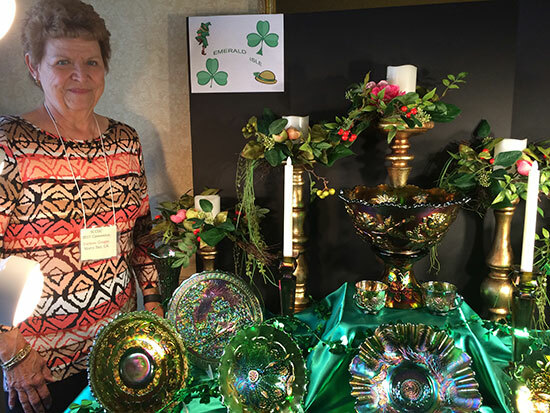 Darlene had the Emerald Green Homestead Plate (the upper plate) that glowed and the stretch finish was very apparent. Keith and Ogie have a beautiful Homestead plate with a stretch finish. John is carefully looking over a celeste blue Butter Ball Server. 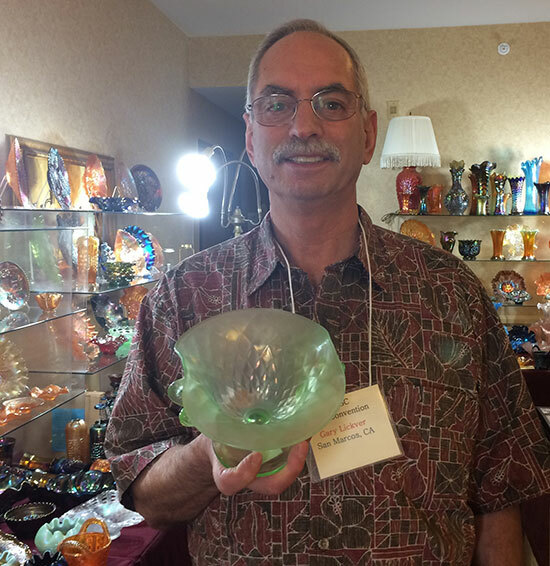 Gary is showing off a beautiful Quilted Diamond Dolphin Compote. Scott has a wonderful display of charcoal vases. Yes, they do show off their iridescence in the dark. Some of his vases have a stretch finish. 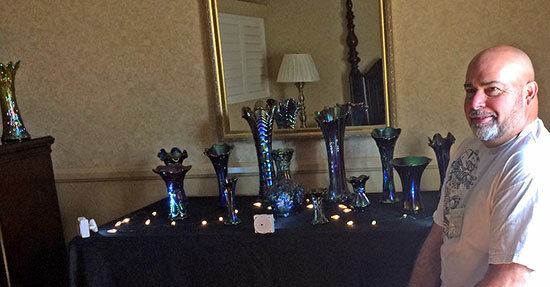 For once, we decided to do a strictly carnival glass display (no stretch glass). We always have enjoyed the rich iridescence on the Ribbon Tie Bowls plus they are very reasonable. Tom had the patterned Cornucopia #950 Fenton Candlesticks on his table. Does anyone have a Cornucopia candlestick in any colors besides Persian Pearl (white) or Aquamarine (ice blue)? Tom was so good as to tell us the history of some of our better pieces. 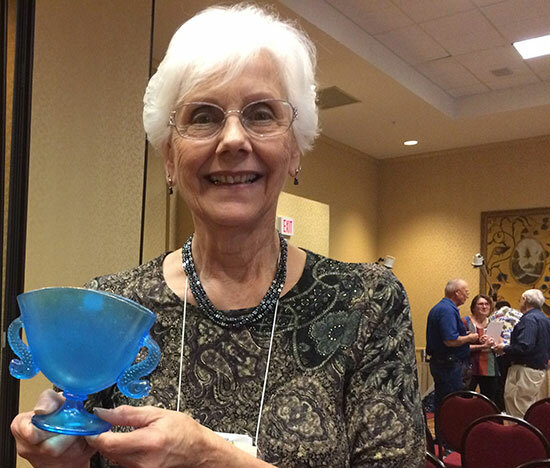 Judith said that when she found this Fenton Dolphin Compote it had apricot paint on the dolphins and the rim. She soaked it in a very weak solution of vinegar and water for days before the paint came off. Do not use paint remover of any kind because you may damage the iridescence as well as the paint!!! 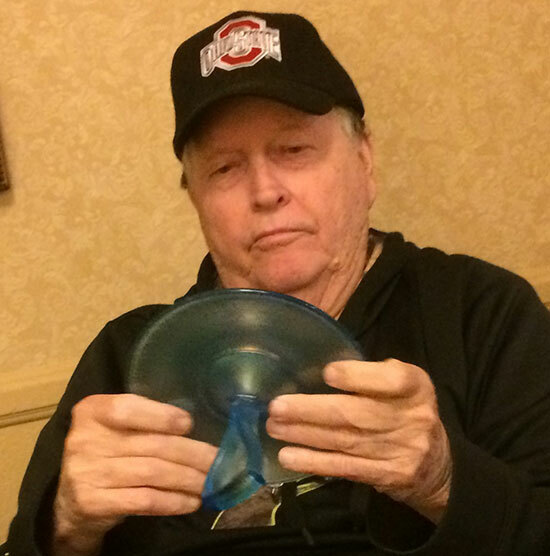 Jeff (President of the So CA Carnival Glass Club) likes his JACKS (Jack in the Pulpit) Vases. Kathi and Darlene worked together in the Hospitality Room. What a spread they put out with the help of the outstanding cooks in the Club. They had so much food left over that they had all kinds of goodies that they put out during the auction. 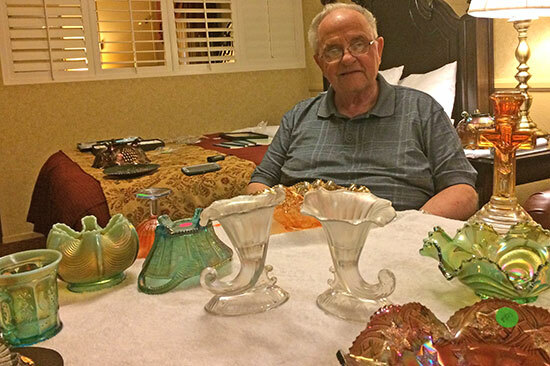 Jim was happy as everyone stayed at the auction to eat and bid on glass. Just had to make sure that you didn’t raise your hand while you were eating or you might have a new piece of glass! 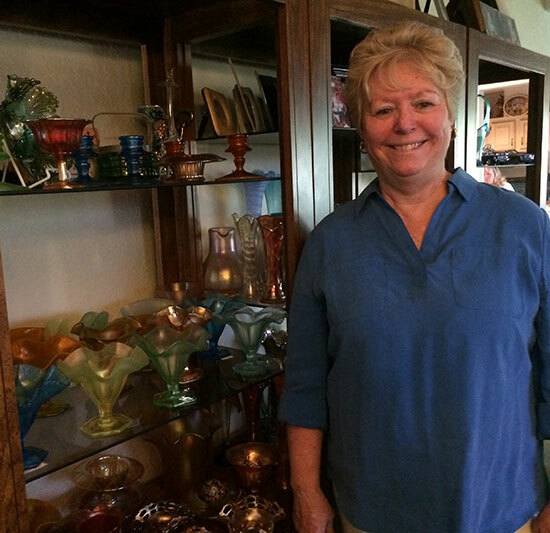 Melody and Gary invited us over to their house to view their wonderful carnival and stretch glass collection. They had the “Taco Man” (I think that was his title) over to cater dinner for us. All we can say is; not sure which we liked more – the tacos or looking at their collection, but we didn’t have to choose!!! Aren’t all of the stretch candlesticks striking in this back lite display? 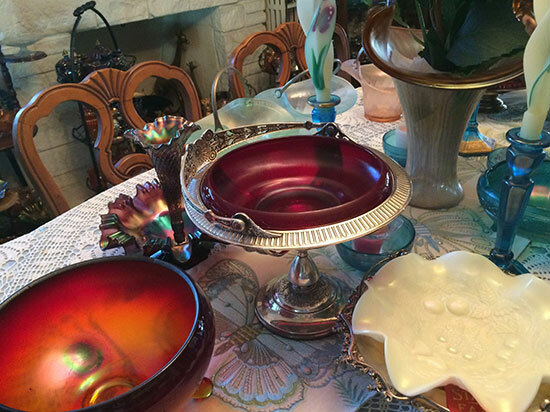 The plain red stretch low bowl is breath taking in the silver bride’s basket! 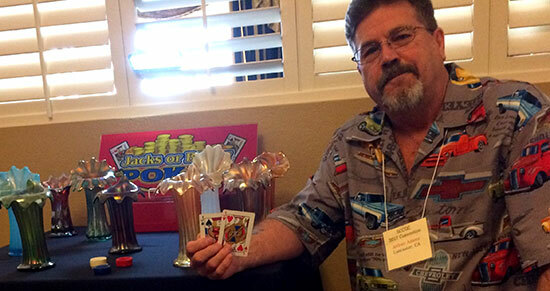 SCCGC convention had a number of other activities, but there is not room in this article to mention all of them. 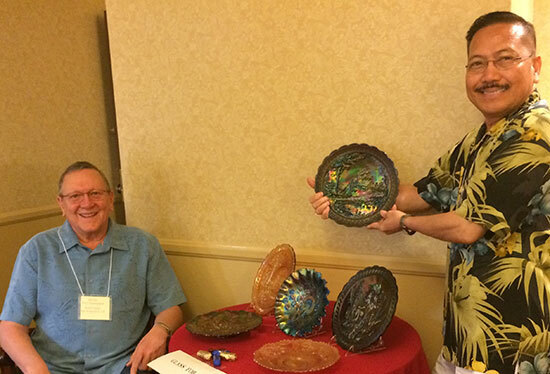 Hope to see everyone next year at the Southern California Carnival Glass Convention. To conclude this Stretch Tuesday, we have a question for you. Is the celeste blue Plaid Bowl in the header carnival or stretch glass?